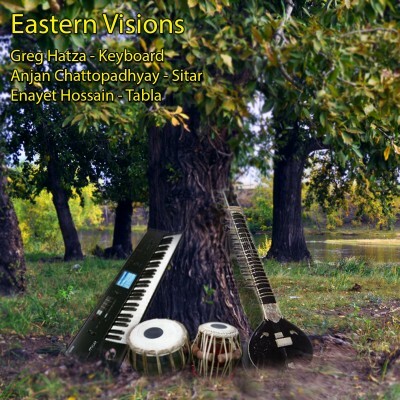 Melodic Intersect: Eastern Visions is the first album released by Melodic Intersect. A truly unique album that explores the coming together of two great traditions, Indian Classical music and Jazz music. The tracks from this album varies in its base from Indian classical, to Indian Folk and Jazz improvisations. It features Anjan Chattopadhyay, a classically trained sitarist based in Kolkata, India. Anjan is very well recognized for his work in Indian classical music, Indian popular music compositions and has scored several Bengali (Regional) Indian movies. He brings a perfect balance to the album. Greg Hatza, a well recognized and renowned Jazz musician based in Baltimore, Maryland has had a long career as a musician. He has several releases to his credit and has also learned Indian classical music, the tabla, the sitar from Baltimore based teacher of Indian music, Ustad Hamid Hossain. His knowledge in both Indian music and Jazz make him one of the rarest musicians in the world. Enayet Hossain, a well known Tabla player based in Baltimore brings in his traditional Classical background of Indian music and explores and shows the versatility of the Tabla, the most famous percussion instrument known throughout the the world today.